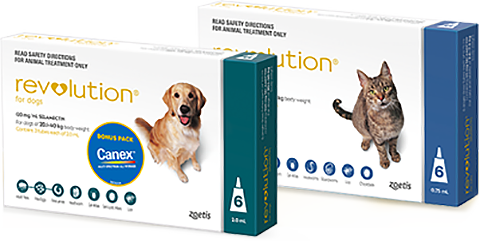 Revolution provides essential vet-grade protection against Fleas, Heartworm and other nasties. Did you know that most flea treatments contain industrial agricultural pesticides? Not Revolution. Revolution contains Selamectin which is unique in that it has been specifically designed for cats and dogs. Click below to see how Revolution protects your cat or dog. with Canex stacks up against the competition. †Scheduling is a national classification system that controls how medicines and poisons are made available to the public. Medicines and poisons are classified into Schedules according to the level of regulatory control over the availability of the medicine or poison, required to protect public health and safety. Scheduled Poisons are indicated by the word CAUTION at the top of the main label. Unlike other products, Revolution is not classified as a Scheduled Poison. Advocate® and Advantage® are registered trademarks of Bayer AG. Frontline® is a registered trademark of Merial. Advocate®, Advantix® and Advantage® are registered trademarks of Bayer AG. Sentinel® is a registered trademark of Novartis Inc., Basel, Switzerland. Frontline® is a registered trademark of Merial. Comfortis® and Panoramis® are registered trademarks of Eli Lilly and Company.